In the summer of 1993, after living in Sweden for six months, I flew back to the States. My flight had a three-hour layover in Iceland’s Keflavík International Airport, just outside of Reykjavík. I remained in the airport for the duration, but I couldn’t shake the curious murmur of destiny that tickled my ears. This place is important. Not Keflavík or Reykjavík, but farther out. One day, you must return. Six years later in Virginia, after I moved in with my husband (then fiancé) Dan, I had a vivid dream. I drifted with the wind over fjord and field to what seemed a farewell scene. A woman with long, dark blonde hair stood beside a horse and rider. The man astride the horse had shoulder-length red hair and a full beard, and I sensed he held a position of importance. I floated toward the woman’s back and suddenly became her. The mergence held long enough for me to exchange good-byes with the man. Then I shifted back out of her and hovered in the air, regaining my modern identity. Without warning, as though whacked over the head with Thor’s hammer, I became infused with knowledge. It was the 10th century, and we’d spoken Old Norse. There’d been a meeting of chieftains, and the red-haired man was setting out on a long journey. I (as the woman) had used precognitive skills to verify his safety and success. I knew he cared for me and hoped we’d be reunited soon. Less clear was our exact location. I received a strong impression of Iceland, but murmurs beyond it hinted at the Isle of Man, the Hebrides, and a land of promise far to the west. Then it dawned on me: the character on horseback was Dan. The one looked nothing like the other, but their essence was the same. It didn’t feel like a dream; it resonated as a moment in history, from Dan’s past and mine. One week later, we snuggled on the couch and watched the film Smilla’s Sense of Snow, part of which takes place in Greenland. Did I?! By week’s end, we’d booked a five-day excursion departing in mid-February. His willingness to make the trip in the dead of winter confirmed what I’d come to believe as truth: I had met my match. Here was a fellow fan of wind and snow. Here, too, was the bearded man I’d known and loved in a distant but distinct dreamtime. We spent a couple of days in Reykjavík and its environs. Two of the more impressive sights were the Strokkur geyser and the majestic, half-frozen Gullfoss (Golden Falls). Honorable mention goes to a “Viking restaurant” in Hafnafjöđur. During our meal, traditionally clad men serenaded us with old Icelandic tunes whose meter and mode conjured visions of longships on the prowl. The food was delicious…until we tried an Icelandic delicacy called hákarl. That’s putrefied shark to you and me! Thanks to a chaser of brennivín, an Icelandic schnapps, we stomached it and lived to tell the tale. Next, we flew up to the “capital of the north,” Akureyri. For three days, we braved the elements to cover as much ground as possible. The snow was deep, and the wind was fierce, which translated to lonely stretches of road where our rental car was the only vehicle around. 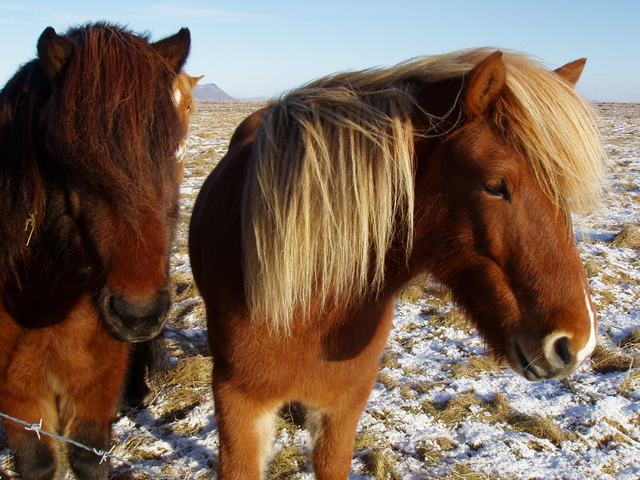 There seemed a definite shortage of fellow tourists, but we did come across a group of Icelandic horses. They squinted and blinked at the icy blasts, and they acknowledged us with quizzical expressions. I could almost hear their thoughts. Are you two crazy? Even we would rather be indoors! Still, we carried on, from the old whaling town of Húsavík to the towering lava formations called Dimmuborgir (“Dark Castles”) of Lake Mývatn. One afternoon as we drove along yet another windswept, deserted road, the clouds parted, allowing a shaft of light to illuminate a giant shape in the distance. It was a volcanic hill, but it had the aura and majesty of a mountain. Its relatively flat top was rounded at the edges, which softened its otherwise looming presence high above the snow-covered plateau. We nicknamed it “Valhalla” because (1) it attracted the only ray of light for miles around, and (2) its brilliance seemed blinding to eyes now accustomed to leaden skies. Those skies remained our constant companion as we explored numerous craters and other volcanic creations around Mývatn, but whenever “Valhalla” came into view, it shone like a beacon. We had to laugh. It seemed preposterous that the sun should ignore every feature of the landscape but one. That night, in our Akureyri hotel room, a strange sound woke me. I rolled over in bed and stared at Dan. He was talking in his sleep, but not in English. It was a Scandinavian tongue, similar to Icelandic, and I almost understood it. I felt right on the verge, like when a word or thought is on the tip of your tongue. Given a slight, indefinable shift, I would’ve comprehended it. All at once, I knew. He was speaking Old Norse. I didn’t wake him, and after a couple of minutes, he stopped. But his easy pronunciation, fluency, and the authority of his speech echoed in my mind. I thought of my mom. Twice before, she heard me speak another language in my sleep: Irish in Ireland and years later, Welsh in Wales. For the record, I’ve never learned those languages, just as Dan has never learned a Scandinavian one. In The Novels of Ravenwood series, the heroes of Books 1 and 3 are knights who’ve recently returned from the Holy Land. They experienced the horrors of battle, but also learned to appreciate aspects of the cultural mix they encountered. I’m still writing the third book, Shadow of the Swan. But you can check out the first book, Flight of the Raven, to learn how the hero’s time overseas influenced him. Happy reading!